Matthew Townsend was made an offender for using a sidewalk without a police officer’s permission, and then accused of a felony for publishing a Facebook post about the incident. “Apparently, holding a protest sign, or condemning government abuse on Facebook, is enough to make somebody a terrorist now,” Matthew wearily observes. A small, wiry man with a luxuriant beard and a contemplative demeanor, Matthew is gainfully employed in Meridian, Idaho as a cook. That is to say, he feeds people, rather than feeding upon them. His abductor, Officer Richard Brockbank of the Meridian Police Department, makes neither butter, nor shoes, nor poetry; instead, he makes “offenders” out of people who have done no injury to anybody. On the evening of February 2, Matthew – a part-time liberty activist – was conducting a one-man protest outside the local branch office of the oxymoronically named Liberty Tax Service. That company often pays people to publicize its services by standing on a sidewalk dressed as the Statue of Liberty. The officer, later identified as Richard Brockbank, continued to “build the stop” – that is to say, probing for an excuse to arrest someone who had not committed an actual crime. At least two other officers responded to Brockbank’s urgent call for assistance. As he conversed with his supervisor, another officer took the opportunity to lecture Matthew about his civic responsibilities. “He told me that I need to read the Constitution,” Matthew told me. Either out of politeness or a prudent desire not to antagonize his captor, Matthew refrained from pointing out that he has probably forgotten more about that document than the officer has ever learned. Although he doesn’t recall having any previous interactions with the officers who kidnapped him on February 2, he said it was “extremely likely” that such contacts had occurred. “I’ve recorded hundreds of interactions with cops just here in Meridian,” Matthew notes, many of them occurring within a few blocks of his house – which until he became a part-time Cop Watch activist had been an exceptionally lucrative ambush spot for the blue-suited banditti. His pickup truck prominently displays an “Ada County Copwatch” bumper sticker, and a few years ago Matthew organized a campaign to recall Ada County Sheriff Gary Raney. During last year’s election, Townsend paid a small filing fee to become a candidate for the position of Ada County Coroner. His campaign consisted of displaying a single sign in his front yard that attracted national press attention. Previously, Matthew ran for the Meridian City Council in the hope of making police officers more accountable to the public. Since becoming a Cop Watch activist in 2010, Matthew has made himself locally conspicuous and has done nothing to disguise or attenuate his entirely commendable contempt for the process of armed revenue-harvesting. At no point during the February 2 encounter did Matthew offer any resistance, nor did he “obstruct” Brockbank in any way – unless a refusal to admit to a non-existent offense qualifies for that description. 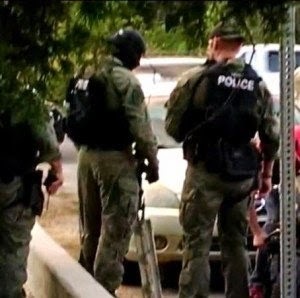 Overkill as the default: SWAT raid at a Meridian yard sale. No statute requires a citizen to agree with a police officer, admit to an accusation made by one, or to stand in rapt, docile silence waiting for permission to leave when an officer has refused to charge him with a crime. Brockbank’s attempt to detain Matthew was rooted in a sense of proprietary privilege, not the law. “I was arrested for `contempt of cop,’” Matthew wryly – and correctly – concludes. His kidnappers demanded a $300 ransom – or, as they would insist on calling it, “bond” – and designated March 19 as the date for a court hearing to validate the abduction. Nothing in that post constituted a threat or an incitement to violence. It was a pure exercise of what we are told is the constitutionally protected right to petition for a redress of grievances – in this case, armed abduction under color of “law.” When Matthew showed up for his hearing a few hours later, however, his court-appointed attorney informed him that the Ada County Sheriff’s Office was prepared to arrest him at the courthouse. Officer Shannon Taylor with Ada County DA Jan Bennets. The post was tagged to dozens of people and Facebook pages – including many mainstream and independent media outlets. Ironically, the sole “witness” to Matthew’s purported offense, and supposed victim of his alleged threat, was not among those tagged in the post. However, the Meridian PD and prosecutor’s office approached another judge in an ex parte proceeding and obtained both an arrest warrant and no-contact order. That judge’s identity remains a mystery: The affidavit and warrant were immediately placed under a judicial seal, and the signature on the no-contact order is an indecipherable scrawl. That order forbids Matthew to come within 100 feet of the pitiable being known as Officer Richard Brockbank. The warrant was executed at a time, and in a fashion, best suited to the purpose of intimidation. “When I heard the knock, I was asleep, and the dogs went crazy,” Matthew relates. The dogs were “my biggest concern” – a fact made obvious by the notice posted on his front door advising police officers that his dogs are harmless and instructing any visiting cops not to shoot them on a whim. “It was totally dark outside” when three Ada County deputies arrived and told Matthew they had a warrant for his arrest. He walked up to the front door and placed his hands out to be cuffed. 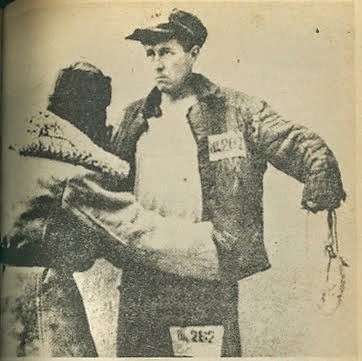 Denied the opportunity to discover or plant “evidence,” the deputies had to be satisfied with seizing and transporting a political prisoner in a fashion worthy of their Soviet forebears. Under Idaho Criminal Rule 41, an arrest warrant “shall be served in the daytime, unless the issuing authority, by appropriate provision in the warrant, and for reasonable cause shown, authorizes its execution at times other than daytime.” Since the timid, paling specimen known as Officer Richard Brockbank was already cowering in the shelter of a protection order, the nighttime arrest couldn’t be justified as a protective measure. An individual dragged from the warmth and security of his bed and taken away, shackled, in the darkness by armed strangers is supposed to feel tiny, powerless, and insignificant. These conditions are intended to demonstrate the hopelessness of someone fed into the apparatus of violence and misery called the State. When this is done on a Friday evening, the expectation is that the victim will spend an entire weekend in a government cage, under the scrutiny of, and subject to, the whims of State-licensed dispensers of violence. Or, as summarized in marginally literate fashion by a contemporary police apologist: “They are the repo men, you're the car. Shut the f*ck up and get towed and the court is your only recourse." The point of yanking a person from his home and imprisoning him at night is to assert the State’s ownership over him, and the ease with which everything can be taken from him – including his life. Unlike the functionaries who seized and caged him, Matthew has an honest job – one he may have lost if his mother hadn’t been able to pay a significant fraction of $25,000 bail that had been imposed on him as an accused felon. Owing to his mother’s sacrificial intervention, Matt was at work just a few hours after his most recent abduction, serving the community preyed upon by the people who are trying to send him to prison without a particle of justification. Matthew’s arraignment on the “intimidation” charge – which is a patently transparent act of official retaliation – is scheduled for March 25. His trial for “resisting and obstruction charge” – or, more honestly described, contempt of cop – is slated to begin on June 4th. His court-appointed attorney is trying to persuade him to waive his right to a trial by jury and settle for a bench trial. Matthew doesn’t appear interested in that option, nor should he be, in my view. Juries in Idaho, as elsewhere in the soyuz, tend to be much too deferential to prosecutors. The case against Matthew involves such exuberant claims of official privilege – and such obvious malice --that it might trigger the gag reflex of an Idaho jury. It could also precipitate an avalanche of well-earned public ridicule for the incurably self-important people responsible for this travesty, beginning with the bold and valiant – yet oddly timid and fragile – Officer Richard Brockbank. Matthew’s case brings to mind one salient fact that has emerged from the miasma of racial politics in Ferguson, Missouri. The municipal police department in that town operated a seamless racket in which minor misconduct was monetized for the benefit of the city government. In December 2014, roughly seventy-five percent of the town’s residents were the subject of arrest warrants. In 2013, there were 1.5 offenses per city resident in Ferguson – not because the city was beset with actual crime, but rather because of what one commentator correctly calls the “gangsterish `shakedown’ methods” of the city’s police department and court system. Ferguson police were vividly aware of opportunities to issue citations that would harvest revenue from the poor on behalf of the local political elite – and they never let such an opportunity elude them. Matthew Townsend’s experience was a product of the same predatory policing. 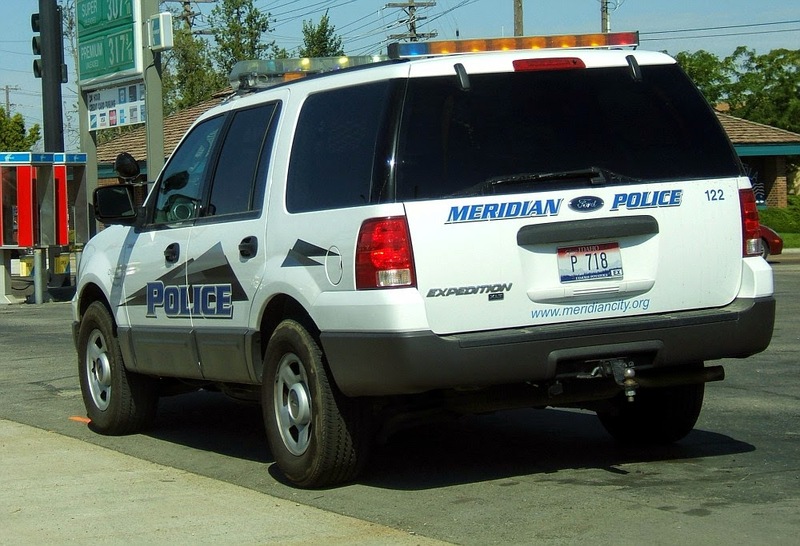 Out of a non-existent “offense,” Meridian’s municipal plunderbund has already extracted thousands of dollars from Matthew and his mother, and they intend to turn the handle on the wringer until they have extorted the utmost farthing. In Matthew’s case, the casual cruelty that typifies this system has been replaced with an obvious determination to destroy someone whose commitment to principle and civic activism have made him an unbearable nuisance. His abductors would take great satisfaction in crushing a Copwatcher. Within the next few weeks, unless something akin to a miracle occurs, my family and I will be homeless. For the second time in about five years, our landlord has allowed our home to go into foreclosure. In this case, the deadbeat was also a law enforcement officer -- so draw your own conclusions. Finding an affordable rental home for a family of eight is challenging at any time. In the current market -- and owing to our unique circumstances, which I've previously described -- doing so is within a respectable distance of "impossible." Since losing my last steady job in 2006, I've been able -- barely -- to support our family through a series of part-time and freelance jobs and what I've been able to earn through Pro Libertate. Over the past year one major source of income disappeared through the death of an employer. Several others have dried up in frustratingly familiar fashion: People are eager to enlist my services as an author and editor, but willing to pay, at best, roughly what I can earn through collecting and recycling cans. If there is anybody among my readership who can offer advice or assistance in helping our family locate a new home, I would be immensely grateful -- as I continue to be for all of the generous help so many of you have given to this enterprise. Thank you so much. I am having an issue of Meridian police alowing my ex and her friends to stalk,harass,vandalize..do hate crimes..tresspass and bully by the meridian police..I am going thru channels by news station's and civil rights attorneys to sue meridian police..you may have to as well. I admire your writing abilities and passion for liberty. I did not see a contact link. So, I leave this message here. I sent you a small donation via Paypal. Hope it helps. ...and a suggestion; Have you considered gaining certification to teach English as a second language? Easy to do and working online from home. I suspect that if you've home-schooled your children, some of the teens might be able to assist in this type of endeavor. Feel free to contact me if you would like some contact info for ESL certification. Best of luck and keep up the excellent writing and speaking truth. Is copblock aware? Is police the police aware? Cop Block is aware of this situation. It's where I originally found about Mr. Matthews. I then Google it to find this article. This Felony charge is absurd but could become a real problem for Mr. Townsend. Although i question his cop stalking prowess. However, what is the update? I'd like to know the update of his court appearance that I believe was yesterday. I want to keep people updated. I also want to share this in hopes others will help donated. Are there anymore videos? I don't see any more when subscribing on Youtube. Lol.....oh, this is also why I will be homeschooling my children when their old enough....so they dont grow up with the potential of being influenced by morons like this. Stop drinking the koolaid. ^ this guy will be home-schooling his kids... he calls people morons, yet doesn't know how to spell "they're". The arrest of Mr. Townsend was in retaliation for the ACLU's law suit it had just won in Idaho, the law suit explained to the Idaho Courts people have 1st amendment rights to protest on public sidewalks if they step into the street or if the officer can coerce a confession that the citizen stepped in the street then the can arrest. The State of Idaho does not recognize Due Process 14th Amend., so prosecutors and Judges have no obligation to the Constitution or even Idaho Statutes, they simply interpret the laws to fit any arrest i.e. 18-705 of Mr. Townsend was a false arrest because the office had no articulable reason for the Terry Stop, there was no crime. Please understand prosecutors in Idaho do not represent the people, nor are they finders of fact, they bring in 10 million dollars a year in revenue to most Idaho county's. 10% of the money is paid to the State general account the remaining 90% would go to the city . In fact, that 90-10 split remains in effect for the violation of any city ordinance. When the county ordinance is violated, 10% of the TAKE goes to the State general account and 90% to the District Court. I have never discovered who gets that bonus, judges prosecutors or elected officials. Look up District Court Fund to find the revenue for your county. Idaho does not have Constitutional protection for citizens even under Federal Laws, as explained in Renea D. Jones v. Idaho it is a 42-1983 civil rights case, Idaho simply explained Idaho citizen have no Civil Rights under the color of Law.